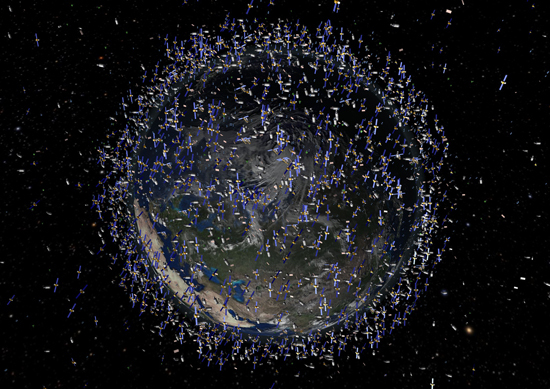 With each new piece of space junk, space missions become more and more in danger. Just a few weeks ago, on October 16th, a Russian Briz-M rocket failed and exploded while in orbit. While no one was on board and thus there were no casualties, the explosion of the rocket does present a problem as well as bringing to light a concern for organizations seeking to further the progress of space travel. That problem is the growing cloud of space debris that is cluttering the orbit of the planet Earth. Just one rocket left more than 500 fragments of itself floating around the planet. While some of these may harmlessly pass into the Earth’s atmosphere and burn up upon reentry, most of the pieces will simply continue to circle. Since they are moving at such a high speed, they are potential threats to not only the International Space Station, but any satellite or future space mission that has to fly through them. One small piece, moving at high velocity, can cause major damage to the complicated machinery of space craft. What most people aren’t aware of is the fact that there are hundreds of millions of tiny pieces of debris in orbit right now. More than 22,000 of these pieces are around the size of a softball and another 500,000 are about marble-sized. Even these small pieces are a danger. While the ISS can maneuver out of the way when it sees a piece of debris coming, it still consumes expensive fuel and hastens the need for a mission to resupply it. The concern all this raises is that of a continually growing cloud of rubble that could eventually cause all future space missions to have an increased risk of danger. Satellites could be crippled, rockets punctured and space stations forced to do continual repairs. Some of this can be remedied by advancing our technology and creating space craft that are more easily able to resist damage from debris, but the true impact of the space junk will not be known until we have to face it head-on as a major obstacle to future missions beyond our planet.